Freeway Art Bag Design 2015 ~ Philippine Freebies, Promos, Contests and MORE! 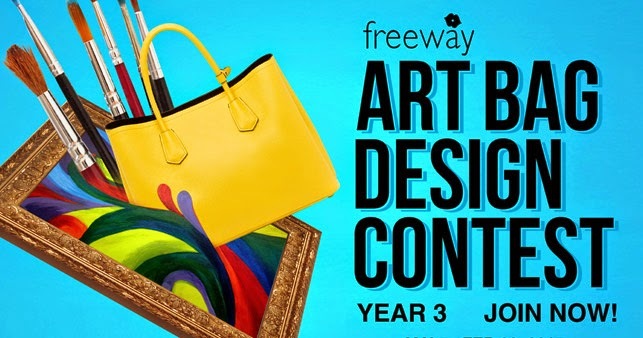 The Freeway Art Bag Design Contest is here on its 3rd year! If you were not able to join in the previous competition, now is the time to let those creative juices flowing and showcase your creativity by making a unique design for Freeway's tote bag. Artwork should include the elements of Nationalism, Filipino pride or our country's Art and Culture. If you think you have the skill and passion to share your ideas, simply download the provided art bag template online to serve as your guide. Submit your design via the contest app. You may submit as many entries as you want but you can't enter the same design twice. Once approved, invite your friend to vote for your artwork for more chances of winning P10,000 CASH + P10,000 Freeway GCs. The winning pieces will also be put into production as part of Freeway's National Artist Collector’s Series 2015 together with the featured National Artist. You may use traditional mediums such as oil, watercolor, charcoal, pen and ink or modern digital graphics. Upload a scanned or good quality photo of your artwork via the Freeway Art Bag Contest Facebook App/Tab.